I read a while ago that Britain's roads now have a pothole every 120 yards. I can believe it, given the state that the roads seem to be in over there. Now that we're accustomed to Dutch roads, British roads which appear on the TV always look rather badly maintained. This is a regular topic on British cycling blogs, and the stories keep coming up. There were claims over the last year that London's potholes increased markedly over winter and that there could well be in excess of 2 million nationwide. That article points to the high level of motor dependence in the UK as a reason why the country suffers so badly from potholes. It's clearly a big problem, but is it being addressed ? Rather, there seems to be a problem of people trying to talk themselves out of having to fix these problems. What actually counts as "a pothole" in British roads ? Gloucestershire says that a hole needs to be "the depth of a "golf ball" (1.6in, 40mm) and the width of a 'large dinner plate' (11.8in, 300mm)" before it is regarded as needing to be repaired, while Suffolk says "unless the defect is on a minor road, when it must be about the size of a "dustbin lid" (23.6in, 600mm) to warrant urgent action." The terrible quality of surfaces is yet another problem for cyclists in the UK, who almost always have to "share such roads" with a lot of motor vehicles. There are documented examples of riding through potholes causing death to cyclists, and also of swerving to avoid them having the same effect. When not lethal, injuries can be extremely unpleasant and painful, and result in claims against councils. I was lucky enough never to fall due to a pothole in the UK, but nasty jarring bumps when riding on busy roads did nothing to enhance my cycling. And what's happening about it ? Well, in London funding for fixing potholes has been cut. Here in Assen (and I think it's pretty much standard Dutch policy as I've seen it elsewhere), defects which occur on the roads due to winter conditions are patched up even before the ice has melted. That's what you see in this photo from our local newspaper (from last winter, that's how long ago I started this post. However, the city also has a policy of renewing whole road surfaces before problems occur. There is a rolling programme where road (and cycle path) surfaces are resurfaced every few years - and this isn't only a skim over the top but involves digging down and replacing what's under the surface as well. When this is done, the work is synchronized with the gas, electric, telephone and other companies to prevent it being dug up again soon afterwards. Cycle paths of course don't suffer from the same degree of damage because they don't have heavy vehicles on them. Most are exactly the same as before winter, and of course nice new smooth surfaces like this remain nice and smooth. Why isn't the same thing done in the UK ? Why are the roads in a mess ? It's not a new problem. John Lennon wrote way back in 1967 about there being "4000 holes in Blackburn Lancashire". 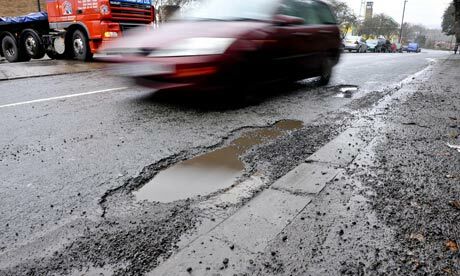 The photo at the top, of a large pothole on a British road, comes from the Guardian article. As it happens, someone who I used to work for also just blogged on potholes, from a totally different perspective. How nice to have company in our misery. I read somewhere that Los Angeles is some fifty years behind its pothole curve. It's in the Maasstraat, near the school. That said, it's only a small one and doesn't form a problem for cyclist. Thanks for letting me know, Peter. I'll have to come and take a photo of it ! Those potholes are just reverse speedbumps to reduce speeding. I remember hearing in the news that because of the weather conditions last winter, many potholes and other cracks and bumps appeared. However, they were fixed almost immediately, or a temporary solution was provided until it could be fixed. Apart from that, there is a so-called "meldpunt" in every city where you can give information where there is a flaw in the pavement (or a traffic situation) and it will be fixed as soon as possible.